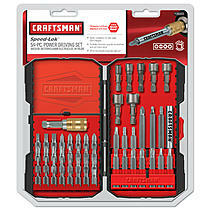 Sears offers Craftsman 54 pc. Driving Set 26393 for $12.49 (Was: $24.99). The tools in this 54 pc. driver and bit set are great for working with a variety of materials, including soft metals, wood and plastic. Use them for woodworking, home repairs and tackling that honey-do list inside and outside the house.